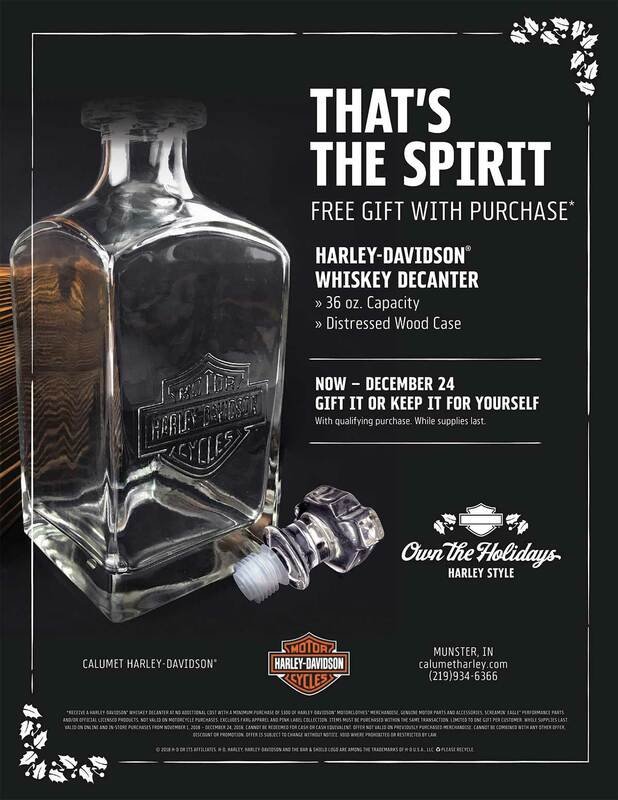 Receive a Harley-Davidson® whiskey decanter at no additional cost with a minimum purchase of $300 of Harley-Davidson® Motorclothes® merchandise, Genuine Motor Parts and Accessories, Screamin’ Eagle® Performance Parts and/or official licensed products. Not valid on motorcycle purchases. Excludes FXRG apparel and Pink Label Collection. Items must be purchased within the same transaction. Limited to one gift per customer. While supplies last. Valid on online and in-store purchases from November 1, 2018 –December 24, 2018. Cannot be redeemed for cash or cash equivalent. Offer not valid on previously purchased merchandise. Cannot be combined with any other offer, discount or promotion. Offer is subject to change without notice. Void where prohibited.